There are many video games that we gamers wish had sequels. Many of these are games that have had a huge impact on our lives. Be it something small, like affecting our preferences for certain genres, or something larger, such as leaving a lasting impression on us. Games like Final Fantasy, Metal Gear Solid, The Legend of Zelda, or Mario Bros. are some of the titles that fall under this category and still live to this day. The game I want to talk about though, isn’t as fortunate as the other franchises I’ve mentioned. It has one sequel on the Nintendo DS (that wasn’t handled by the original team), it has been re-released several times on different platforms, and it has been featured as a “guest” in other franchises. The game I want to talk to you readers about is my favorite game of all time: Okami. First, a lesson on Okami: the game was originally released on the Sony Playstation 2 in 2007. It was published by Capcom but was developed by an independent, and now defunct, studio funded by Capcom: Clover Studios. Written and directed by Hideki Kamiya, who at the time was known for his work on Resident Evil 2, Okami is an adventure game in the same vein as The Legend of Zelda. The title Okami is a play on the Japanese words for god and wolf. Rather appropriate, seeing as the main character of the game, Amaterasu, is one of the most important gods in Shinto, and who also happens to be a wolf in the game. If it still isn’t evident to this point, Okami’s story and setting is based heavily on Japanese folklore. The story starts off with a flashback of events 100 years prior to the start of the game. The narrator describes a struggle between the village of Kamiki and an eight-headed serpent known as Orochi. Every year during the Full-Moon festival, Kamiki Village must send a sacrificial maiden to Orochi to sate the demon and avoid the village’s destruction. During the eve of the Full-Moon festival a white wolf would always be seen wandering around the village leading the villagers to believe that the wolf, whom they dubbed Shiranui, was a familiar of Orochi. On one particular festival, the maiden Nami was chosen as a sacrifice to Orochi. The swordsman Nagi, being in love with Nami, went off to battle the demon in order to save his beloved. In a surprising turn of events, Shiranui appeared to the swordsman and aided him in his battle with Orochi. At battle’s end Nagi emerged victorious in saving Nami and sealing Orochi away, however the victory came at a cost. Shiranui was fatally wounded during the fight and was near death when the battle came to an end. To commemorate the wolf’s brave sacrifice, Kamiki village erected a statue in honor of Shiranui. 100 years later, a shadowy figure removes Nagi’s sword from Orochi’s seal which awakens the serpent. In response to the imminent threat, Sakuya the guardian spirit of Kamiki Village resurrects Shiranui; whose real identity turns out to be the sun god Amaterasu. These events set into motion the beginning of Okami. exploration mechanics of the game. 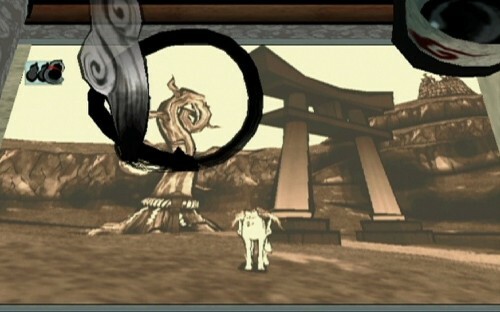 With the use of the Celestial Brush Amaterasu is able to manipulate the world around her by drawing on the screen. Back to talking about gameplay though: with the Celestial Brush, Amaterasu is able to do things such as rebuilding destroyed objects, manipulating and creating fire, slowing down time, creating bombs, and growing trees, among other abilities. This mechanic is the crux of the game and will be heavily used throughout the duration of Okami. Now, there isn’t a particular aspect about Okami that I can pin-point as a reason why I love the game so much. The story, gameplay, graphics, settings, and characters all tie together so well that there isn’t a single weak link nor a single characteristic that outshines the rest. game to refresh myself for this article, and the very first cutscene managed to get me teary-eyed. The characters are excellent, being a diverse and quirky cast that had me emotionally attached even to the most minor characters. 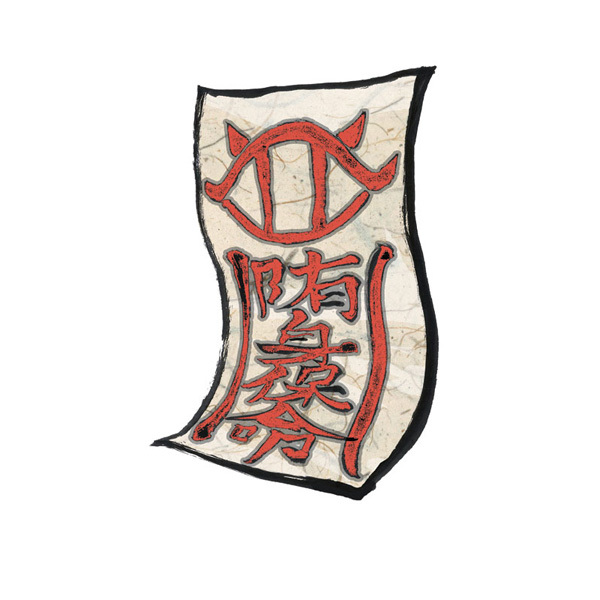 Case in point: one of my favorite characters in the game is a PIECE OF PAPER named Tobi, who only appears in one dungeon. He is such a minor character yet his involvement in the story manages to get me emotional every time. As I mentioned prior, the gameplay is stellar, with its capability to incorporate most of Amaterasu’s abilities in every aspect of the game. The Celestial Brush being the linchpin of the game’s gameplay allowed for some creative situations. A situation such as the enemy being made of fire? Douse the flames with water and proceed to dispatch the enemy, or manipulate the fire and use it to burn the other enemies. Stuff like that gave the player more options. It’s also great that each brush technique had uses both in and out of battle. Like the Veil of Mist ability for example; with it, you can slow down time for puzzles, or you can use it to slow down enemies. It also has a secondary function of removing certain barriers used by enemies. Another element of note is the fact that bosses are unique and distinct encounters from one another, each having a semi-puzzle solving element to each fight. Exploration is another worthwhile mention seeing as the world of Nippon is both vast and beautiful, making it very enjoyable to traverse. Okami does one thing in particular that most games fail to do though, and that’s to have really good pacing. As I’ve said, the game revolves around the turmoil caused by Orochi. However, once you confront and defeat Orochi, the game doesn’t end quite yet. Turns-out, that’s only the first part of a three-part game and you have two-thirds of a game to go. Not to mention, parts two and three up the scale and intensity of the plot. Okami succeeds not only in keeping the pace steady all throughout the adventure, but also in not ending on a sequel tease. The game was a three-part story, yet the game was released as a single package. In an industry that persists in releasing games with incomplete plots, Okami is a rare example of a game that provides more story than what is required. The entire package itself resonates so well with me that I can confidently say that, to me, Okami is the closest title we have so far to a perfect game. This is exactly why I think Okami is a game that deserves a sequel. Technically speaking, the game already has one. That sequel is known as Okamiden, which was released in 2011 for the Nintendo DS. While being a decent follow-up to Okami, Okamiden doesn’t have the same charm as its predecessor. It builds on the foundation laid by the original, but it plays it safe. It doesn’t innovate in any way, nor does it try to surpass Okami. It also doesn’t help that the game’s scale was reduced due to being on a handheld system, and that the game wasn’t handled by the original developers. What I want for Okami is a proper sequel on a platform that will allow the same, if not greater, ambition of the original. The game should have a fully realized and explorable world that isn’t hindered by the capabilities of the system. Adjustable difficulty would be a welcome addition as my one complaint for Okami would be that it’s too easy. But most of all, what I want for an Okami sequel would be for it to be handled by its predecssor’s director, Hideki Kamiya, and his team at Platinum Games. As I said, Clover Studios is now defunct because soon after the release of Okami, Capcom closed down the development studio. Most of the former members of Clover are now part of Platinum Games, including Kamiya. Okami left a moderate impact on the video game industry. It has received 2 remakes on both the Wii and PS3, and is also featured in several games such as Marvel vs. Capcom 3, and Tatsunoko vs. Capcom. Kamiya has even reused the Celestial Brush mechanic in his recent game for the WiiU: The Wonderful 101. Despite that, though, Okami still hasn’t gotten any new additions to the franchise. When games like Call of Duty get annual releases, doesn’t something like Okami deserve another shot? It is my hope that one day Capcom teams up with Platinum Games and finally gives Okami the sequel it so greatly deserves. Now if you will excuse me, I must catch up on the playthrough I started for the purpose of this article. It will be the nth time I’ve played Okami and it will not be the last. ← Community Lives On with Season 6 on Yahoo!